The road from King Shaka International Airport to town transitions informatively from the glossy World-Cup era airport architecture into the rolling green Zulu velds, through bright red mud, lush palm forests and finally down onto Durban’s coastal center. The city’s attractiveness is partly exemplified in these competing geographies, a seaside metropolis within the boundaries of the rural landscape of KwaZulu-Natal. Durban, the exemplary hybrid city-pastoral-tropical, Zulu-Indian played host to the first phase of the Constructing Future Cities initiative. As part of the initiative, five women artists were selected to create a piece of work which captured visions for cities, drawing on input from women in Cape Town, Durban and London. 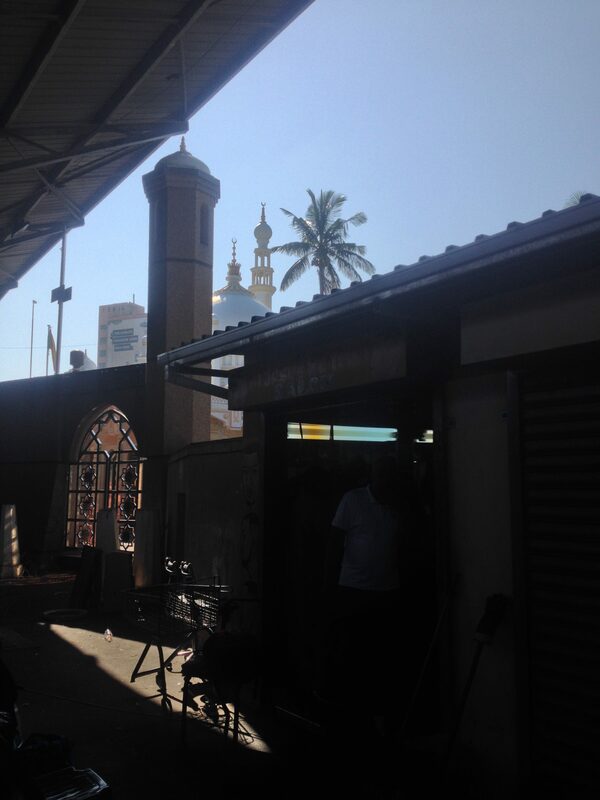 They arrived in Durban for an experiential tour of the city’s spaces and to meet some of its makers. 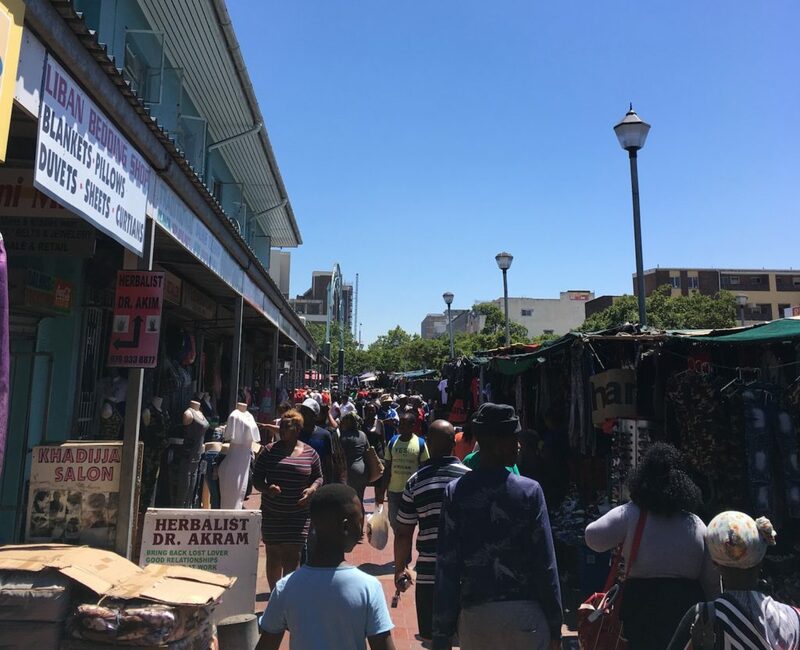 On Thursday April 27th, Freedom Day in South Africa, the programme began with a tour of the Warwick junction, a culturally diverse range of markets under the spiralling, mural painted supports of Durban CBD’s elevated freeways. The artists were hosted by Mbali Mkhize from Urban Lime , a property management company with a number of developments in the city. 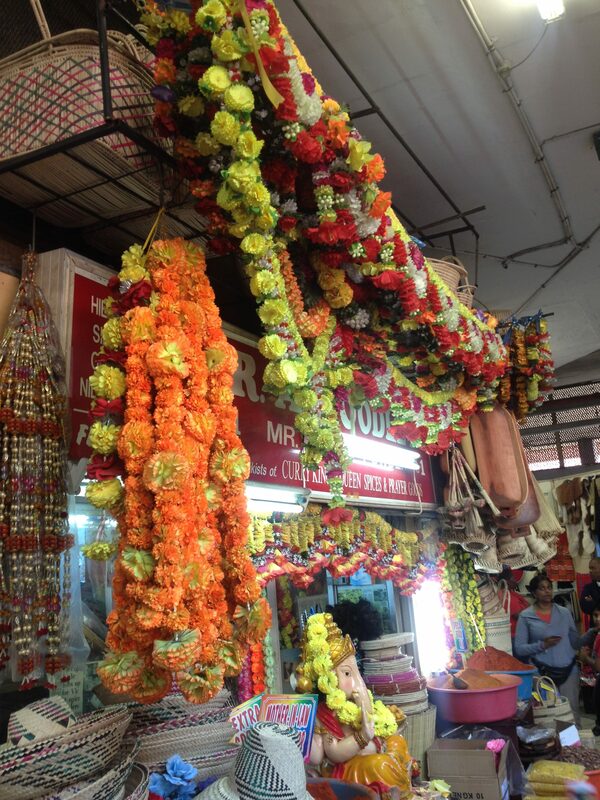 Ms. Mkhize took the artists through the Indian spice stalls and Zulu Muti market, and were shown the distinct products which have emerged over generations of cultural mixing and influencing. There were the traditional Zulu aprons with Indian fabric patterns, the transcontinental diversity of products found in Durban’s expansive vegetable and meat markets. Isibhedes flavored with tumeric and coriander, KZN beef and South-Asian massalas, and of course the famous bunny chow, a distinctly Durban creation of hollowed out bread with curry. From there they walked to the Denis Hurley Center, a community outreach post named after the famed Durban bishop, who in his time was the youngest elected papal officer of his rank. The center, which provides service to Durban’s urban poor through their clinic, feeding scheme, vocational training and educational support, was host to a series of celebrations in commemoration of Freedom Day. The artists arrived just as the celebrations reached a finale. In the outdoor courtyard, an enthusiastic local singer danced and duetted with an African chorus through a catalog of her hits and then stood and sang in unison with the diverse crowd for a rendition of the national anthem. After the anthem, Raymond Perrier, the Director of the Center, introduced himself to the artists and invited them for a visit of the recently re-developed center. Forming part of the left side of a triangular block, the building is neighbored on the other side by the Archdiocese of Durban Cathedral where Mr. Hurley held his post for almost 50 years. Mr. Perrier, with good humor, remarked how his center was probably the only Christian-founded one of its kind to serve Halaal meals. Mr. Perrier also emphasized that it was a space where Durban’s Christians, Muslims, Hindus, Sikhs and Jews freely mingled and worked alongside one another. The year before an event was held in the Cathedral adjacent for gathered Durbanites to listen to the Muslim call to Prayer broadcast through the church’s speakers. Next, Urban Lime’s Ms. Mkhize hosted them at one of the company’s downtown properties: a neglected high-rise recently acquired by the company, and on whose outdoor portico, host to a Future Durban event earlier this year, the artists were granted a grand view onto the recently commissioned illustration of Durban’s Anton Lembede (founder of the ANC’s youth league) hung from an adjacent Urban Lime property. The extended balcony, with its terrace top patches of green amid the concrete facade of the Norman Eaton designed building, suggested great promise for the sensitive restoration Urban Lime is now undertaking on the edifice. The artists were then taken to the Moses Mabidha Stadium, an impressive architectural legacy work from the South African held FIFA World Cup in 2010. Up they went onto the stadium’s sky car, elevating slowly on a circular radius over and onto the stadium’s rooftop. The scenic platform at the end offered instructive views of Durban’s coastal developments and the Art Deco clusters from an earlier time spread across the town. The artists then went off on a cycling tour of the beachfront promenade a paved brick course stretching over miles along downtown’s beachfront, which has also undergone a transformation in the last decade. 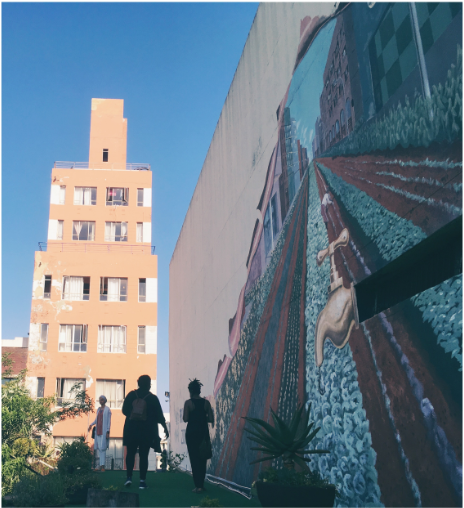 Full of mixed use programming, diverse micro-environments and vastly popular in particular with a diverse mix of Durban’s residents. Durban’s monkey populations lingered playfully around garbage bins, children’s pools splashed periodically onto the elliptically patterned pavements, and families gathered at picnic areas or in sea-facing restaurants for the sunset. The last event of the day was the Afri Cine pop-up event, a frequently hosted night for Durban’s cinephiles to gather for a viewing of works from emerging African directors. That night, the host space was the Con Amore home store; a sort of hipster Ikea, where all the furniture sat on was for sale, and which also housed a stylish coffeehouse, both part of Durban’s urbanely renewed creative neighborhood, the Station Drive Precinct. The next morning was host to a wide-ranging women’s breakfast discussion centred around visions of Durban and on initiatives to fulfill its urban promise. The event was hosted at the Freedom Cafe, an ingenious intersecting set of bright-red containers under a canopied patio in the Greyville neighborhood, where Durban women creatives from a diversity of backgrounds (curators, filmmakers, architects) sat alongside the artists to get a diverse set of perspectives on Durbanity. Views were exchanged on the relationship between the formal and informal in the city, on the immense potential of the city to grow along it own idiosyncratic path, and the hope that a more integrated and collaborative whole could emerge. Following the talk, the artist visited the offices of Ruben Reddy architects, where a conversation with one of the studio’s architects Shaan Steyn was held. She spoke of the discipline’s complicated relationship with feminism and of her own rise in the South African architectural landscape. She informed the artists about the role of women architects in Durban, how they are making their mark on the city’s urban fabric (a R400 Million women-led hospital project has recently been finished along the city’s beachfront) and offered her opinion on the need to further integrate women’s spatial perspective on public space construction. What does it mean for a place to be safe? How might that look different, offer different outcomes, from a woman’s perspective? The artists then lunched on the rooftop at the Priority Zone, a KZN government funded rooftop garden prototype. The first of its kind in Durban, the space proved an apt backdrop to reflect on the program’s proceedings up to that point and take in the the work of a local mural painter’s own vision for the future of cities. That work, a large canvas illustration of a city’s sidewalks and streets repurposed for urban agriculture, served to visualize the ambitions of the programme. Following lunch, a meeting took place with Open Data Durban’s Richard Gevers, a self-described data evangelist. Mr. Gevers and the artists spoke of recent attempts in the country to mixing their respective disciplines, and of their great interest in ambitiously creative projects which communicate the societal and systemic concerns open data has made possible to study further. Mr. Gevers introduced the artists to a project in Johannesburg, where gun-crime live data was used by artists there for a recent work. Police statistics were synchronized to the release of gunshot sounds emerging from a weapon’s barrel and would go off as gun crime was communicated on police records. Many of the artists seemed inspired by the potential to create socially relevant works of art through these sorts of collaborations. The final event of the programme was held at the KwaZulu-Natal Institute for Architecture (KZNIA) headquarters in the Berea precinct of the city. There the artists sat down with the President of KZNIA Kevin Bingham and Karuni Naidoo, chairperson of the Women in Architecture South Africa task team to speak about the progress of gender equality in architecture. Ms. Naidoo, who is also principal/co-founder at CNN architects and spearheaded the publication of a Women in Architecture issue for the KZNIA journal last year, spoke of her progressive vision for the discipline. She encouraged young women architects to present their ideas boldly and to collaborate together in creating spaces and networks for one another. She spoke of her own journey as a black, woman architect in the country and reported more broadly on the great strides she has seen her female colleagues take in crossing former boundaries while still having to struggle against imbalances in the marketing and communication of projects. CONSTRUCTING FUTURE CITIES is a project which supported 5 women artists to produce works to interpret, engage and assemble the views and imagination of young women in the built environment sector in Cape Town, Durban and London. 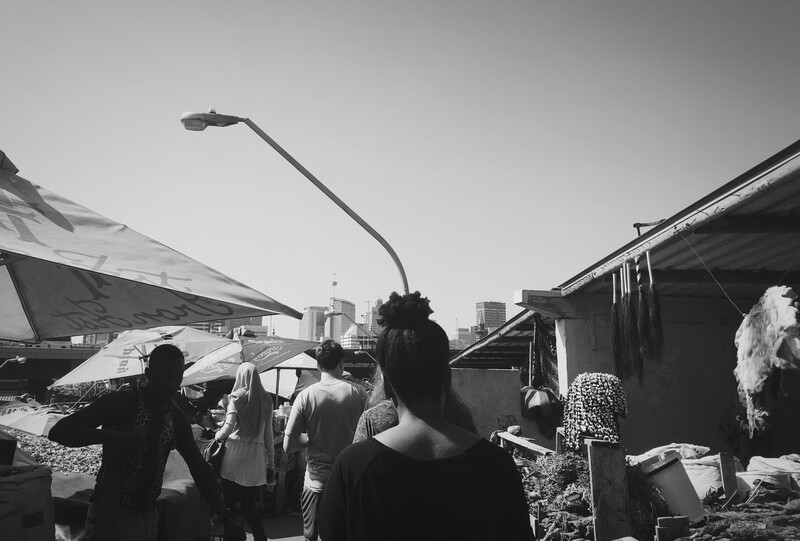 As part of this project, the artists visited Durban with the support of the Urban Lime.